Google Chrome built-in PDF viewer has made it effortless to view web linked PDF files. This feature is enabled by default in all Chrome browsers. So you are thinking, why one should disable this feature? Clicking on the PDF link handles the control to the plug-in to display the file in the browser itself. But when you are in a business to just download PDF files and not to view them all the time, you need to disable the plug-in. This will force PDF files to download instead of opening in the browser. So let us go through the steps to disable and re-enable the plug-in in an easy way. Open Google Chrome browser and type about:plugins into the omnibox address bar and press enter. You will see something like this. 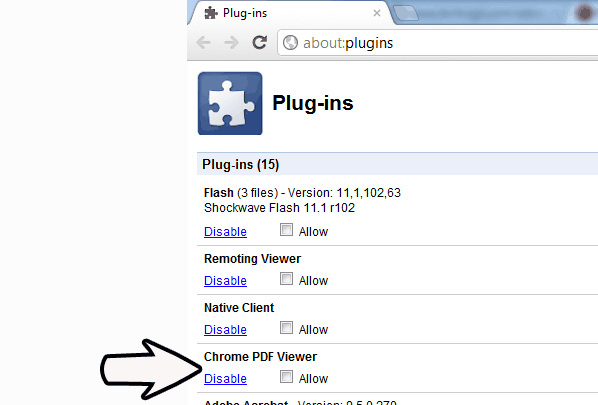 Find the Chrome PDF Viewer in the list and click on the Disable link below that. Clicking on the link will take effect instantly. No need to relaunch the browser. If in future you wish to change it again, you can find the option in the same place.